I most certainly love my green veggies, but doesn’t a healthy helping of cheese (almost) always sweeten the deal? I made today’s recipe – Broccoli and Gruyère Gratin from the November 2009 issue of Real Simple – for the first time over Thanksgiving. Since it serves a crowd, can be made up to a day ahead, and is absolutely delicious, though, it’s perfect for entertaining in any situation. To make a full recipe, I started by roughly chopping 12 cups of broccoli. (The recipe suggests this is two large bunches, but I ended up getting just over 2 cups from each smallish bunch I was able to buy at my grocery store. I chose to use just the tops since I didn’t feel like peeling the stems, but feel free to use the stems if you like.) I have a pasta pot with a steamer basket, so I put an inch of water in the pot, brought it to a simmer, put the steamer basket of broccoli in the pot, and then covered the pot with its lid. (A regular steamer basket that sits inside a pot will do just fine, too; if you use this method, go with 1/2 inch of water instead of a full inch.) I steamed the broccoli until it was just tender (4 minutes) and then transferred it to a large bowl. Next, I made the cheese sauce. In a medium saucepan, I melted 4 tablespoons (1/2 stick) of butter over medium heat. I added 1/4 cup of all-purpose flour and cooked it, stirring constantly, for 2 minutes. Switching from a spoon to a whisk, I whisked in 2 cups of whole milk and simmered the mixture until it was slightly thickened (4 minutes for a full recipe; about 2 minutes and 30 seconds for a half recipe). Although the recipe didn’t specifically say to do this, I whisked my sauce constantly to prevent the bottom from burning and a skin from forming on the top. Once the sauce had thickened, I removed it from the heat and stirred in 1 cup of grated Gruyère cheese, 1/2 teaspoon of coarse salt, and 1/4 teaspoon of ground pepper. I tossed the cheese sauce with the broccoli and transferred the mixture to a shallow 3-quart baking dish. I sprinkled the broccoli with another cup of grated Gruyère and baked it at 375F until it was bubbling and golden brown (40 minutes). I let the dish stand 10 minutes before serving. As a child who loved broccoli drizzled with Cheez Whiz (the things my parents would do to get us to eat vegetables! ), I’m seriously digging this grown-up, sophisticated version of broccoli with cheese. 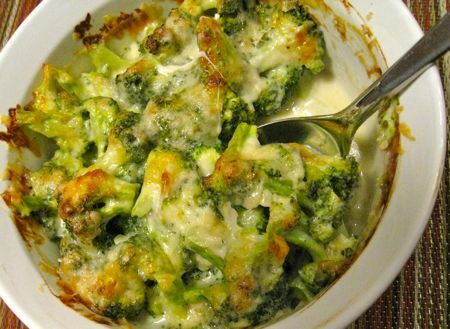 The broccoli becomes tender but not the least bit mushy, and I love the cheesy crust on top. The dish is fairly saucy if you eat it after the 10 minutes of standing time; I think it sat for almost 30 minutes before we ate it on Thanksgiving and the sauce thickened considerably. I liked it both ways. TIPS: I would strongly suggest having all the cheese sauce ingredients measured and ready to go before you start cooking. 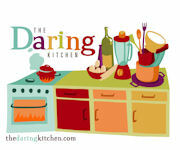 That way, you can just toss and pour them in without having to stop stirring or whisking. Also, if you haven’t worked with Gruyère yet, you may be interested to know (1) it’s a bit pricey, and (2) it’s pungent. In other words, you’ll pay a bit more than you’re used to in order to bring home a pretty stinky cheese. It mellows considerably when baked, though, and it really is delicious. If you don’t like Gruyère, try substituting Swiss or cheddar cheese. broccoli is one of my favorite vegetables.. I googled a cheese sauce recipe, and found yours.. one of my other loves in life is gruyere… I have made this recipe you posted a few times now.. I make the sauce, but sometimes eyeball the amount I pour over top before baking.. I pour just enough to cover, with a bit of ‘pooling’ in the bottom.. that way is bakes and crisps, but is not drenched. the other bit of cheese sauce that is left over (if there is any) I save for pouring over baked potatoes.. thanks for the delicious, yet easy, recipe!